The Hummingbird Program was born out of the firm belief that qualify of life is as important as quality of care. We see each client as a whole person, and we’re committed to care beyond symptoms and physical needs. Our clients, like all of us, are unique individuals with a capacity for joy and the need to feel connected to other people and engaged in the world around us. So we created a unique group of trained professionals solely dedicated to quality of life—the emotional, intellectual, creative, environmental, physical, vocational and spiritual needs we all share as human beings. The Hummingbird Therapeutic Activity Program pairs clients with therapeutic activity specialists trained in helping older adults reengage in old passions and explore new interests. Because no two people are exactly alike, our specialists don’t go in with a one-size-fits-all formula. Activity plans are highly individualized to reflect the unique personality, life history, interests, and abilities of each client. The Hummingbird team engages clients through one-on-one activity sessions, carefully planned outings, and individualized Therapeutic Activity Kits that can be used by family members, care providers, and other care team members at any time to engage clients in a range of meaningful and stimulating activities. Sessions might include memory or sensory games, memoir writing, armchair travel, gardening, creating art or crafts, or special outings to a place connected with a client’s past or special interests. By providing concierge services and products, we support engagement in life through enjoyable activities—and work with families and care providers to create opportunities for joy. To learn more please contact The Hummingbird ProjectSM at (650) 777-7607 or Hummingbird@SageEldercare.com. Whether we’re working with clients in their homes or in a larger care setting, our one-on-one sessions help engage clients in a deeper way, and can be especially helpful for people who are not interested in group programming, have been unable to participate meaningfully in group activities, or simply prefer individualized attention. We are also pleased to offer training and consultation to families and professionals on creative engagement techniques and approaches, particularly for people living with dementia. What are the benefits of engagement in therapeutic activities? Our individualized Therapeutic Activity Kits and Sensory Kits are a hallmark of the Hummingbird Program. These kits are created by the highly experienced Hummingbird team to provide meaningful activities that allow family members to connect with their loved one in a whole new way—and for care providers to engage clients in a range of stimulating activities. Kit activities come with detailed instructions and engaging materials, so you can feel confident as you begin exploring new experiences at the time and pace that works for you. Every activity is designed to stimulate clients in a way that is both therapeutic and enjoyable, and we include specific recommendations for expanding on themes or modifying activities for changing physical or cognitive abilities. While our kits are designed to provide interactive, relational activities, they also engage clients in self-directed exercises that can give family members and care providers a bit of time to tend to other responsibilities. Therapeutic Activity Kits are a collection of engagement tools created by our activity specialists with each client’s interests, life history, and abilities in mind. Activities are researched for success prior to recommendation and every customized kit includes easy-to-use materials and detailed instructions that make the activities come alive. An activity specialist can deliver your customized Therapeutic Activity Kit, along with suggested adaptations for variety or to accommodate changing physical or cognitive abilities. Activity specialists and supervisors are also available to train care providers and family members how to best use the kit, and for ongoing idea generation and support. Sensory Kits are designed to stimulate clients who have functional limitations, but who will still benefit from the attention and engagement of sensory stimulation. They’re also an important non-medication remedy to the agitation, boredom, and frustration often experienced by older adults who need long-term care. As with our Therapeutic Activity Kits, Sensory Kits have been created by the uniquely experienced Hummingbird activity specialists and come with interesting, soothing and often unexpected materials that have a range of sounds, visuals, tastes, and textures. Detailed instructions are included so you can figure out step-by-step how the activity will work best for your client or family member. Depending on our client’s specific situation, an activity specialist might deliver a sensory kit and use it with the client during a session, or model the activities for care providers or family members to use with their client or loved one at any time they want to provide stimulation or ease agitation. We see agitation as a sign of an unmet need, so this is often a time that we’ll introduce Sensory Kits to address the agitation, increase comfort, and help restore well-being. The Hummingbird Program’s activity specialists are what make our one-on-one program truly unique. This eclectic group of professionals is trained to help seniors reengage in creative, intellectual, and sensory activities, explore new interests, and feel connected to family, friends, and care providers. Our professional backgrounds are diverse, including recreation therapy, fine arts, dementia care, music, creative arts therapies, and more. We work one-on-one with clients to draw inspiration from each individual’s life story and goals. What is The Hummingbird Project SM? The Hummingbird ProjectSM is an initiative of Sage Eldercare Solutions that is devoted to providing services and developing products that promote Quality of Life for older adults receiving care. The goal of The Hummingbird ProjectSM is to cultivate joy, engage curiosity, and foster personal expression. To that end, we created the Hummingbird Therapeutic Activity Program, as well as individualized Activity and Sensory Kits that can be used by family members and care attendants at any time. The Hummingbird Therapeutic Activity Program pairs clients with professionally trained therapeutic activity specialists to enhance quality of life. Activity plans are created for each individual to reflect their unique personality, life history, interests, and abilities. The Hummingbird Program provides one-on-one activity and engagement services tailored to the needs of the client and family. What is an activity specialist? An activity specialist is a professional who is trained to help clients reengage in old passions and explore new interests. Our backgrounds are diverse including horticulture, creative and fine arts, philosophy, memory support, history, academia and more. What type of training do activity specialists have? Our activity specialists have at least a BA or BS and ten or more years of experience working with older adults. Many have a master’s degree or higher. How frequently do activity specialists see clients? Typically, activity specialists see clients once a week, but sometimes more or less, depending on the frequency the client desires. Where are your activity specialists located? San Mateo, Santa Clara, San Francisco Counties, Marin, Alameda, Contra Costa, Sacramento and Placer Counties. How do I begin working with a Hummingbird Activity Specialist? Please contact us at (650) 777-7607 or Hummingbird@SageEldercare.com to make a referral to the Hummingbird Program. The first step for most services is a complimentary half-hour telephone consultation with interested parties or family members to describe the program, answer questions and learn about the client’s needs and interests. We then arrange to start services with an in person meeting in which an activity specialist (sometimes two) visit the client to make an assessment and provide recommendations. How can the Hummingbird Program help me or my loved one? By providing concierge services to clients and their families, we support engagement in life through enjoyable activities that are specifically designed for each client as a unique individual. Our program goals include reducing isolation, combating loneliness, and working with families and caregivers to create opportunities for joy. 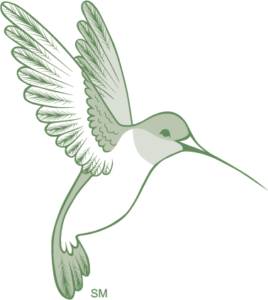 What services does the Hummingbird Program provide? One-on-one activity sessions are typically two to three hours in length, and include a detailed report, often with a picture from the session, for the client’s family. Outings can be four or more hours. Consultation with families, care providers, and professionals is available to establish plans for engaging clients in quality of life activities. This might include idea generating, individualized training for care team members (family or professional care providers), preparing and organizing materials, training professional care providers, and more. We also provide brief one-on-one interventions to address agitation, alleviate boredom that may be causing behavioral expressions of an unmet need, or provide support during times of transition. Therapeutic Activity Kits are a hallmark of our program and can be utilized by family members, care providers, and other care team members as a way to engage clients in a range of stimulating activities. We specialize in both customized activity kits and sensory kits. Therapeutic Activity Kits are a collection of engagement tools, created based on a client’s unique interests. These items are researched for success prior to recommendation and might include brain fitness games, creative expression books, projects. and a range of other items. Sensory Kits are a collection of soothing, focused engagement tools that provide stimulation, increase engaging activity, decrease agitation, and restore calm. Detailed instructions are provided with the kit. An activity specialist is available to deliver the kit and demonstrate how the items can be used and suggest adaptations for variety and to address changing needs. The activity specialist will also provide instructions to the client/family/care provider for how to best deliver the interventions. Therapeutic activity kits take approximately 3-4 hours to conceptualize, research and create; the time spent is billed at our hourly rate. At your request, we provide an estimate for approval prior to ordering materials. Otherwise, we ask for a budget of $150 for kit components. Quality of Life Assessments are in-depth assessments focused solely on a client’s quality of life goals by offering specific interventions for an activity specialist, care manager, family member, or professional care provider to carry out. A detailed quality of life assessment outlines quality of life goals with a list of creative means to meet these goals and specific instructions on how to do so. This culminates in a training led by the activity specialist to support successful implementation of the recommendations. "Looks like everyone is enjoying their time together! My Dad looks so happy....thank you all for taking such good care of him :)"
"It appears that you two have hit a home run! The client herself said, Thank you for the energy you bring to me every week—we have fun together!" "I’m really happy with the activity specialist’s help!! We have my parents over for dinner on Thursday nights and, last night, we had my Mom help with some basic food preparation, which I could tell she enjoyed. We got the idea from these reports on the Activity Specialist sessions and what she is doing with my Mom. I really look forward to reading these summaries each week!" "You taught me how to enjoy life again—thank you." Before meeting this client, our activity specialist had been told that she was living with dementia and more often than not, presented an aggressive behavior. As our activity specialist walked through the room for their first encounter, the client warmly greeted her and was elated that they shared a common heritage. The client took pleasure in showing her beautiful home and shared stories from when she was young. She welcomed our activity specialist back to her home with open arms and from that day on a special bond was created. When our activity specialist arrives to the client’s home now, she immediately recognizes her and enjoys catching up on the past week's events. "I am "over the top" thrilled with these reports and progresses! As I so vehemently defended her "right to a better life" to her doctors in early December when they really wanted to "write her off.” She is reacting exactly as I hoped she would, given the encouragement she needed!!! I literally could "do a dance"!!!!!" Many legends hold that hummingbirds possess magical qualities. It is believed that hummingbirds hover timelessly, bringing hope and harmony to all who see them. Just as the hummingbird passes from flower to flower drinking nectar, we too must relish the sweetness that life brings day to day. The hummingbird’s elegance reflects the splendor that is everywhere in everything and in everyone. We must recognize this brilliance of daily life and open ourselves to all of life’s gifts, while also embracing our own sense of self. The Hummingbird Therapeutic Activity Program seeks to bring happiness and delight to our clients by ensuring a fullness of life. It is our hope that clients will not only recognize the beauty in the world around them, but also the beauty within themselves.